Albuquerque is a beautiful city to visit no matter the time of year. If you're going to be in town during the month of November, or a local looking for happenings around the city, read on for this local event guide. The festival features workshop-style classes, over 30 hours of milongas (dance sessions) with DJs, and lots of tango dancing. The festival takes place at the Las Puertas, located at 1512 1st Street NW. There are full days of milongas that take place over a 3-day weekend, and for a signature, special touch custom cakes are served at each milonga to make it extra sweet. All levels are welcome. The Animal Humane of New Mexico raises funds with this annual event, held at Balloon Fiesta Park. In addition to running or walking with your dog, there is a pet carnival, shopping, and the chance to adopt a pet if you don't have one. Register individually or as a team, to help homeless pets. Run a 5K or dawdle a two-mile walk with your four-legged friends. There will be food, entertainment, and vendors throughout the day. 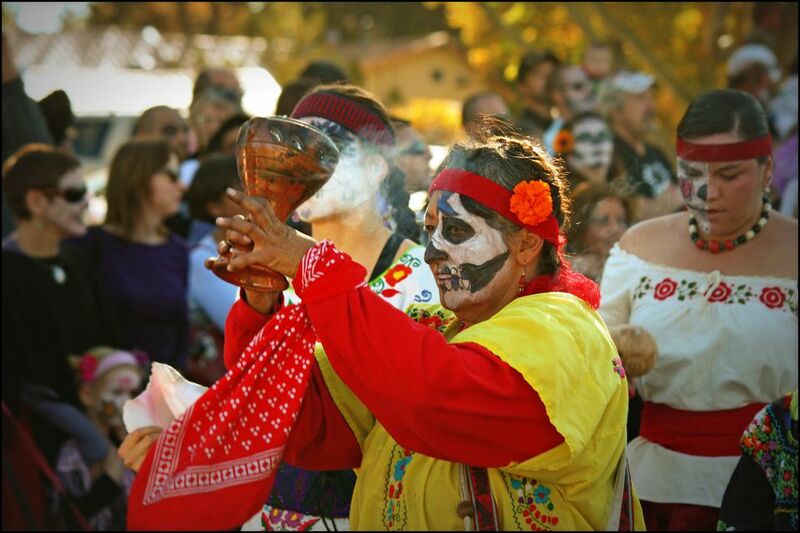 Taking place over several weeks in October and November, (though officially celebrated the day after Halloween) South Broadway celebrates the tradition of the Day of the Dead with altars, an art market, and live entertainment. The community celebration features family activities, food face painting, and Dia festivities. Art and science meet under the planetarium dome for these live presentations at the planetarium in the New Mexico Museum of Natural History and Science. With over 20 different galleries throughout the city participating in the First Friday ARTScrawl, you can choose which ones to visit at no cost to find out what's happening with guilds, individual artists, and ongoing shows. The annual Scandinavian Festival features Scandinavian folk art, jewelry, cookies, kids' crafts Scandinavian dancing and more. You're sure to that perfect gift for the upcoming holidays. The annual Southwest Bacon Fest takes place at the Balloon Fiesta Park. There will be over 50 of Albuquerque's chefs cooking up bacon treats, live music, bacon eating contests, a bacon poetry contest and fun for the kids. Tickets include admission to the Festival and the Balloon Museum. Bacon ice cream, anyone? There are a good many events in the Albuquerque area to honor veterans. Find out about the various ways to honor veterans in this guide to events and ceremonies. Learn about sandhill cranes and the other birds and wildlife at the Bosque del Apache. There will be a wildlife art show, expo tent, and lots of activities for kids. Workshops cover photography and raptors. See why people travel the world to attend this event. Contestants compete for the titles of Miss and Mr. New Mexico Pride. Titleholders have the chance to be ambassadors for events at other locations, and entertainers will be on hand as well. See it at the African American Performing Arts Center. Rooted in tradition, the celebration of Thanksgiving brings family and friends together for the most wonderful of sentiments: giving thanks. Enjoy the holiday with your family -- and if you're not cooking, here's where to find some brunch, buffet, takeout or dinner. This annual holiday show features over 200 artists, entertainment, food, and holiday music. There will be a Holiday Creation Station for kids, where they can craft their own gifts. Find it at the Manuel Lujan complex at New Mexico Expo. Join the choral artists of Quintessence as they sing Handel's Messiah at Immanuel Presbyterian Church for a free holiday event. Bring your own music score or use one provided. The annual Albuquerque Magic Show takes place at the KiMo Theater. Five different magicians perform different magical stunts in a one-of-a-kind show. Check the official website for ticket prices and show times. The men's choral group deProfundis will perform choral works that include familiar carols and spirituals. Hear them perform over Thanksgiving weekend at St. Michael/All Angels Church and Immanuel Presbyterian Church. Tickets are available at the door using cash or check. The River of Lights features light displays of animals and other creatures to walk through, with new ones are added every year. The light show takes place at the Botanic Gardens from 6 to 9:30 p.m. Closed December 24 and 25.